I hope you have enjoyed Canadian Thanksgiving and ate lots and lots of turkey. Every year, my mother makes the juiciest turkey ever, however, she forgot to buy a turkey for this Thanksgiving. I missed eating her turkey. There is always American Thanksgiving, even thought we are Canadians. As every year, we have a family reunion in which families from all over Canada reunite in Montreal to have Thanksgiving dinner. Since I can't break family tradition, I decided to organize a "Thanksgiving Eve Dinner" with friends, collegues and my bro on Sunday. 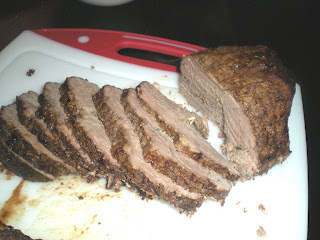 Cooking turkey takes a long time to be done, so I ended buying roast beef since it was on special. I won't go into details on the cooking steps as I blogged about roast beef on December 2008, here are some useful informations. The best technique when a meat thermometer is not available is by touch, I called it the Chef Ramsay's technique. If the touch of the meat is like your cheeks, it's rare, your chin for medium rare and your forehead for well done. 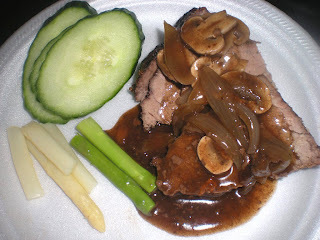 I'm pretty sure most of you wonder how to make the best gravy for roast beef. My brother and I made the best and delicious sauce we had ever, we were so surprised of the results. The following day, on Thanksgiving, some of my collegues made this sauce for their family. 1. 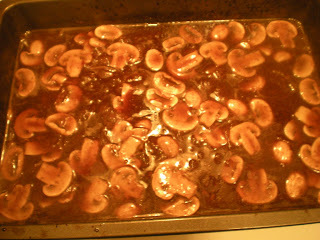 After roasting, add oil, mushroom, onions, garlic to pan drippings. Place over medium heat and sauté until tender. 2. 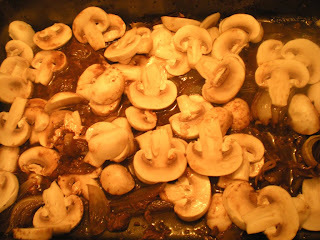 In a small bowl, combine a couple tablespoon of beef broth with starch to make a slurry. Pour the remaining beef broth onto the pan and stir in the slurry. 3. Add red wine and simmer until reduced by 1/4 to 1/3. Add salt and pepper to taste. What brand of red wine did you use? Now I'm getting so hungry. Wish I could have it right now for lunch. Very inviting! I used the red wine from France - Mommessin Wines. Any cheap cooking red wine will do.